Monday 24 Jan – ran intervals at the gym on the treadmill. Sort of. Not exactly the same as in the park. The speeds really didn’t vary that much, it was more a question of inclines. Bizarre, but still, I ran. 26 Jan again on the treadmill. I think I did 45 minutes 7 km but not sure. Can’t really remember. All I know is I felt like hell going in and felt way better going out. Was so happy I went. 28 January – Berlin! My running gear took up half the space in my suitcase, so there was no skipping these runs despite the extreme cold. Half hour warm up walk 3.1 km from Oranienbergstrasse to the park. Very, very, very cold. Thanks goodness there was sunshine at least. Did my first set of German training in Volkspark Friedrichshain – run 40 mns about 6 km? Did some intervals too. Then ran most of 3.1 km home. So proud of myself! GREAT workout in Berlin! 30 January – still in Berlin. This time there was no sunshine and it was very cold. 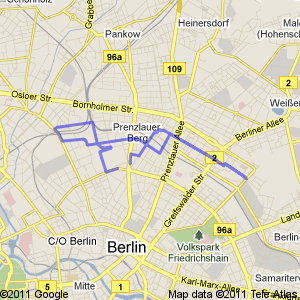 Started in Mauer Park through Prenzlauer Berg heading East to Erich-Weinert-Straße. Ran through some branché neighborhoods with families and youngsters out strolling around. At one point I started running in the street and a car full of people pulled up and said something to me in German. I said, sorry I don’t understand German. It took him a few minutes to find the words in English, all the while he was rolling along slowly beside me in his car. Finally he said, “you cannot run in the street.” I said “Ok, thanks” and kept on going! After all, I am a runner, I am a (half) marathoner. I am getting stronger with every step. These Germans are incredibly respectful of traffic signs. They don’t dare cross the street unless there is a green “walk” sign, even if no cars are anywhere in sight for miles. They don’t even think about it! Even in this freezing cold weather! It’s hilarious! Anyway I ran until I hit a sort of major busy highway in the middle of nowhere. I stopped to snap a photo o the street sign, avoided speaking to 4 dodgy characters who got out of their car and started coming towards me (Scary!) saying things in German that I didn’t understand. I turned around and ran back the same way, running fast and looking over my shoulder to make sure they weren’t following me. Then I was back in the friendly neighborhood. All told about 1.5 hours of running. Again, very proud of myself. This entry was posted on 1 February 2011 by ladymissmba. It was filed under Half Marathon training 2011 .